Shaun T is ready to help take you to the next step of insane fitness. All you have to do is give him 45 minutes for 30 days and he will take you from good shape to all-star shape. Plus almost anyone knows his methods have already been proven effective. Look at his original program Insanity. That program has helped thousands of people get off their butts and step into the best shape of their lives. And with Insanity: The Asylum, it will take you from insane to insanely crazy. Shaun T’s story starts in his native home of New Jersey. There he was born and raised, waiting and ready to take on the world. Growing up he was always an athlete. That eventually led him to a choice between an athletic scholarship to one university and an academic scholarship to another. After careful consideration he chose the academic scholarship and found his way to Rowan University. There he began his studies, made new friends, and, unbeknownst to him, started down the road that would lead him on the journey to becoming the Shaun T we know and love today. Shaun T’s voyage into becoming a personal trainer all started one day because he looked in the mirror. While at his university he took more than fair share advantage of the unlimited cafeteria card and now it had begun to show. But, Shaun T, not willing to be done in, changed his major to sports science and began working out religiously everyday. It was after one specific class though, that Shaun T found his true calling. Because of his curriculum Shaun had to attend a group exercise instruction class. It was after that first class Shaun T knew he had found his calling. And as the saying goes, the rest was history. Shaun T began developing his career after graduating with a B.S. He moved to L.A. and danced in theater and television. This eventually lead him to choreographing, which lead him to his infamous Hip Hop Abs, which of course then lead him to the program he’s most well known for, Insanity. Now, he’ll be made famous yet again for one more thing…The Asylum. As said before, this is a sports-based workout. It combines moves that professional athletes use everyday to train and condition themselves into the superstars they now are. Shaun T has taken those moves and that drive and has channeled it into what he likes to call the Athletic Matrix. This breakthrough pro athlete training method uses dynamic multi-directional movements. These movements activate multiple muscle groups at the exact same time, which makes you work faster, jump harder, and get ripped and lean in a fraction of the time. With only a few pieces of equipment like the Agility Ladder and the Speed Rope, Shaun T will whip you into shape with more focus, skill, and drive. Exactly like a pro athlete. All it takes is motivation and dedication. And in just one month, 30 days, you will have a newer and better you. And we aren’t just talking about a hot-bod either. You’ll have more agility. You’ll be able to run faster, jump higher, and have double the endurance. And this can all be done in just 6 simple, yet be it intense, workouts. There are six workouts associated with this program. Plus, because Shaun T loves you so much and wants to see you succeed, has even included to extra bonus workouts. An example of one of the workouts you’ll encounter in this program is Speed & Agility. This video is made up of heart-pounding, breath-sucking, cardio drills that are designed to speed up your metabolism and burn calories like nobodies business. Another workout DVD is Vertical Ply. Get ready for your legs and gluteus to burn because this workout targets your biggest muscles to trigger the greatest amount of fat burn. But if you compare that to the Game Day workout, it may not seem so bad. Game Day is the extreme athletic training that helps incinerate fat from every part of your body so you can look good at any angle you turn. Seriously, the mirror will love you. A few of the other workouts are ones like Strength. This is a total body workout that, of course, strengthens you from head to toe. It will help you build and sculpt the long lean muscles you’ve always desired. And of course let’s not forget your core in Back To Core. This workout will engage every inch of your core, which helps blow away fat and trim your middle section. But don’t worry; Shaun T isn’t going to leave you without just a little bit of a breather. In the workout DVD Relief, you’ll be able to stretch out your sore muscles while still keeping your metabolism revved up to help your body prepare for what’s to come. All of the workouts are given to you to help get you in the best shape possible. In fact when put to the test, The Asylum was proven to have helped people lose an average of 18 pounds in just 30 days! Other typical average workout plans only show an average of 5-8 pounds a month. You don’t have to be a genius at math to know that by those numbers alone The Asylum has something to offer you. Shaun T also suggests taking a few supplements while participating in The Asylum. The first is Shakeology. This is a shake that is designed to help you eliminate the need for junk food, while giving you a healthy meal replacement option designed for ultimate weight loss. The second supplement is the Results and Recovery Formula. This post workout drink provides you with right balance of proteins and carbohydrates to help replenish the body, mend sore muscles, and restore energy. And finally you have the E&E Energy and Endurance. This is the opposite of the Recovery Formula because this supplement is a pre workout drink. It helps boost your energy levels so you are ready to bring it and push it to the max. It is scientifically formulated to improve endurance and help you maintain focus as you go through your workout. If you’re ready to take that next step in fitness, if you’re ready to train at a pro athletes level, than The Asylum is exactly what you need. Shaun T and the gang at Beach Body are not only ready and willing to help you, but THEY WANT TOO. They want to see you succeed. And they want to do whatever it takes to help you reach your fitness goals. They prove this by providing you with 24/7 free online support when you order The Asylum kit. You don’t have to go into this alone. Shaun T doesn’t want that. The team at Beach Body doesn’t want that. And everyone knows transformation is always easier with a support system. Free online support isn’t the only you’ll get. You’ll also get the Agility Ladder and Speed Rope you need to complete each workout. Plus you’ll get the Guide Play Book which helps map out your next 30 days of transformation using this program. But that’s not all; you’ll also receive the nutrition guide, the workout calendar, and the Athletic Performance Assessment. The APA is a performance measure tool that helps track your improvements over the next 30 days. With everything The Asylum offers there is no reason to not try. It’s a proven workout method that will not only give you the body you want, but will improve your abilities tremendously. That’s why this workout program is so unique. It doesn’t just focus on getting you a fantastic body, which of course it does. But it wants to hone in and improve your athletic ability overall. 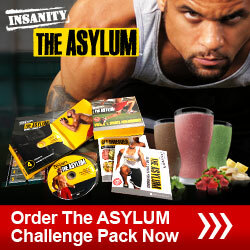 So why not get a little crazy and join Shaun T and his team in The Asylum. The base of of Insanity: The Asylum includes the main 6 workouts, an agility ladder, speed rope, a Asylum workout calendar, a guide to the program, and a nutritional plan. You also get 2 bonus workouts; Sports Performance Assesment and Overtime. The Insanity: The Asylum Deluxe kit includes everything in the base kit but also includes a Chin up bar, a Chin up support device, and strength bands. 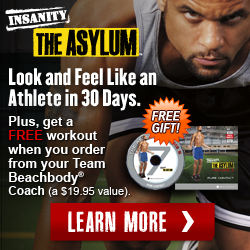 Volume 2 of Insanity the Asylum is your next 30 days after volume 1. You get 7 all new workouts, a playbook for vol 2, a meal plan, a wall calandar, and the Pure Contact DVD for free. If you are interested in getting everything in the original base kit plus the volume 2 items, here is the package for you. The only thing it does not include is the chin up bar.